My head’s exploding when too much information is trying to take over my brain. And I’m not the only one. Of course, you can help your students remember and retrieve learning materials by teaching them the most effective learning techniques. I wrote a blog post about those learning techniques last year and I’m going to give you some extra tips today. 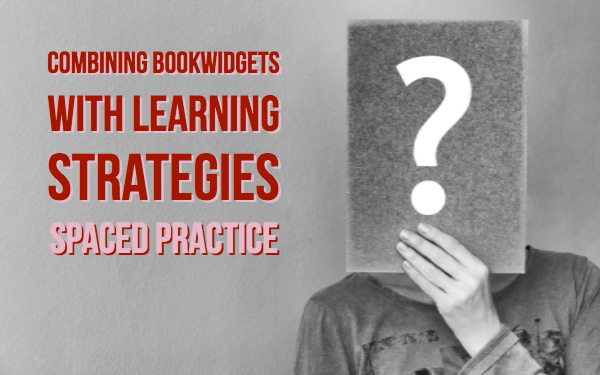 For each learning technique, I’m going to give you an explicit lesson idea with BookWidgets. How can you design your lessons, so that students will remember and so they will have fun doing so? The BookWidgets library has over 40 creative exercises templates, and some of them can be used to support the most effective learning strategies. I’ll give you my lesson ideas in 6 separate blog posts: one for each learning technique. You can find the second blog post about retrieval practice right here. 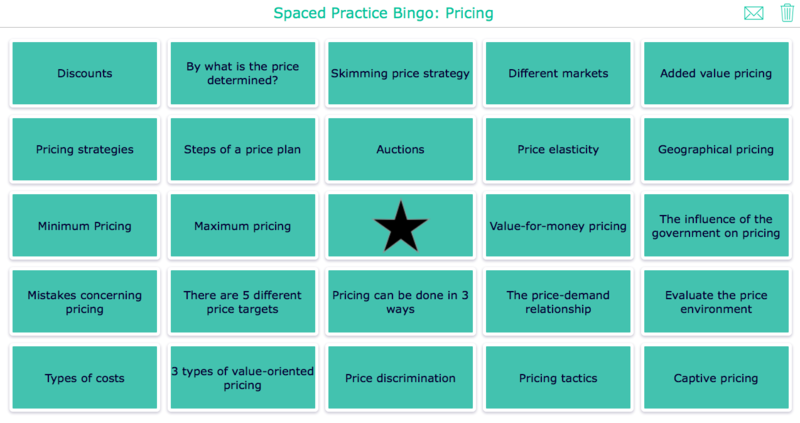 (Download the spaced practice poster here). Studies show that studying five hours spread out across two weeks is better than studying the exact same amount of hours right before the exam. The lesson you have to pass on to your students: No cramming, but spaced practice! There are a few widgets you could use to help your students study and spread learning materials. The planner widget helps students plan when to learn for tests or exams. It’s important to start studying in time. You can add events students can schedule, or students can make their own planning. You can plan learning topics, textbook pages and lesson topics. You can also just plan days and the hours students have to spend learning. That last one gives them more freedom and responsibility. In the example below, the teacher has already defined the chapters, but they still need to be planned by the student. These are rough guidelines, but the student will have to divide the chapters into little chunks by adding items. As a teacher, you can do that for them as well. But it’s always nice to see if your students' plannings are realistic or not. Click on the image to take a look! You can use the Timeline widget just like the planner. This widget has some more options for students. Ask them to insert their notes by uploading a picture to the timeline. You can ask them to answer a question as well, to make sure they learned in an effective way. Students can make a planning and send it to the teacher. You could check if their planning is realistic or not. days of the week and hours. How long to study, which day of the week? days of the week and pages or learning material topics/subjects. What to study, which day of the week? Days of the week and questions about the learning material, inserted by the teacher. In this example, students have to write down each day how long they studied and what they studied, followed by an image of their work. This can be a mindmap, a summary, etc. By clicking on the envelope in the upper right corner, students can send it to their teacher so you can see if they put in an effort or not. 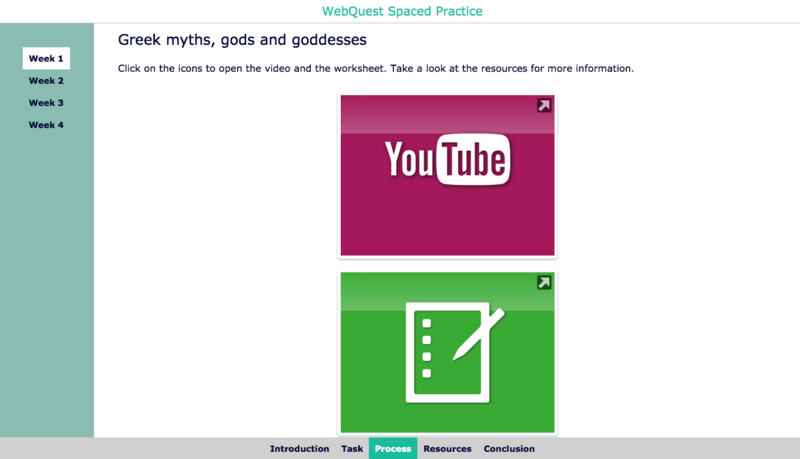 The Webquest widget gives you the possibility to combine text, images, links, and other widgets in one complete widget or lesson. You can create different tabs that represent themes or topics, dates or different exercises. You choose how you classify your widgets. Include the lesson material in one place. This makes it easier for students to learn the right materials and to find structure in your learning materials, themes and topics. 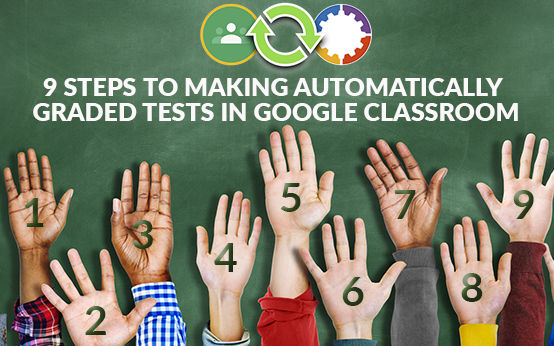 Include quizzes so students can test themselves, and see if they understand and remember what they just learned. Students can always go back to the webquest and take the quiz as many times they want. Practicing doesn’t always have to be boring. There’s a game that can help students practice as well, and all of you know it: Bingo. What are the 24 most important things in your course, students should really know? Put them in the bingo widget. These can be questions, or just one strong, comprehensive keyword. Students take the bingo sheet with them and start practicing. Goal: to have as much bingo’s (5 boxes in a row) as you can get. This means that they have to figure out an answer to each question on the bingo sheet, or that they have to be able to explain the keyword extensively. When they master the question or the keyword, they can tick off that box on the digital bingo sheet. You could tell them that having one bingo (or 5 in a row) a day is good enough to start with. This means that students will spread their practicing over a few days. The digital bingo widget will save the boxes that were ticked off before, when opening the widget later again. Flashcards are perfect for chunking the learning material into little pieces. That’s because a flashcard has little information on its card and students can choose how many flashcards they go through. It’s also a fast way to learn and easy to start over again, and again, and again. 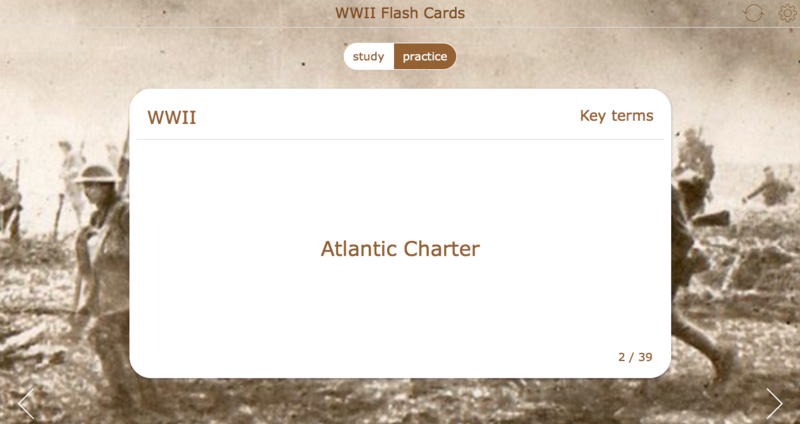 The flashcard widget has a practice mode as well, which remembers what card or topic you had wrong or didn’t understand. Students can go through the flashcards pile as many times they want. Let them practice at least once a day. You can add new flashcards after a new lesson as well. The pile will get bigger, and the students will have more to remember. 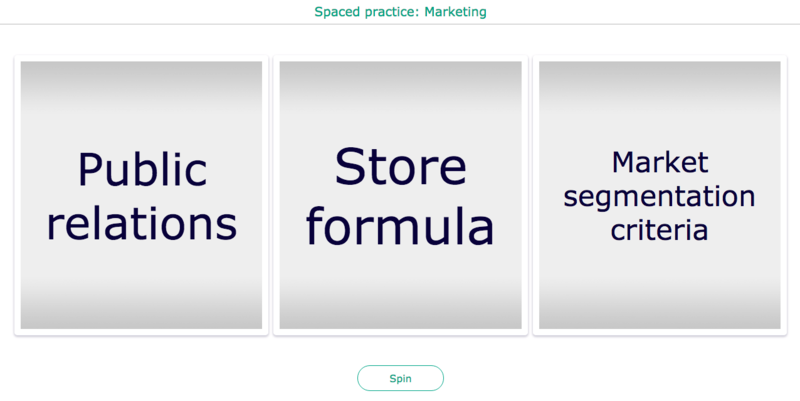 Spaced practice is, again, the solution to keep a hand on the information. This widget allows you to create random wheels with text or images in it. Students can spin the wheel and randomly chosen images or text will show. As a teacher, you can also structure the wheels. 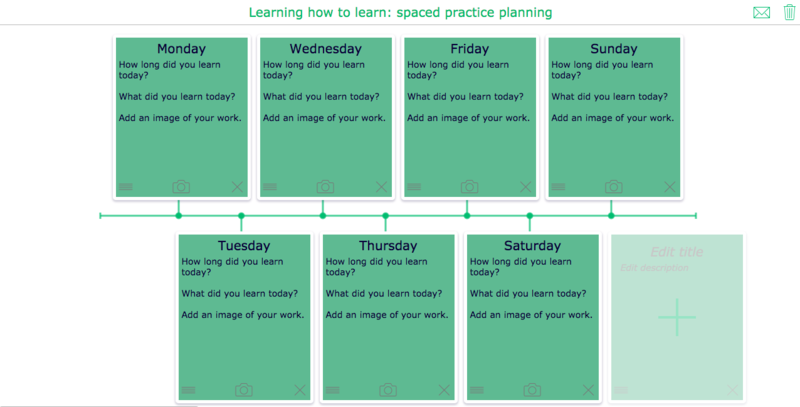 So how can you encourage students to use this widget for spaced practice? Well, give them the assignment to spin the wheels once a day. That’s it. Now they have to describe everything they know about the three random images, keywords, or text. The next day, they spin the wheels again and get words, questions or images that need some thinking. 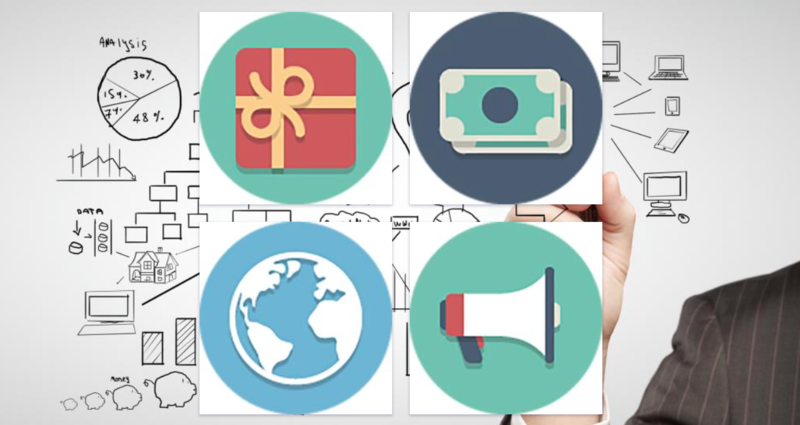 “A tile a day, makes the lesson stay.” Use the tiptile widget to insert images with a short explanation, a video, or a piece of audio. 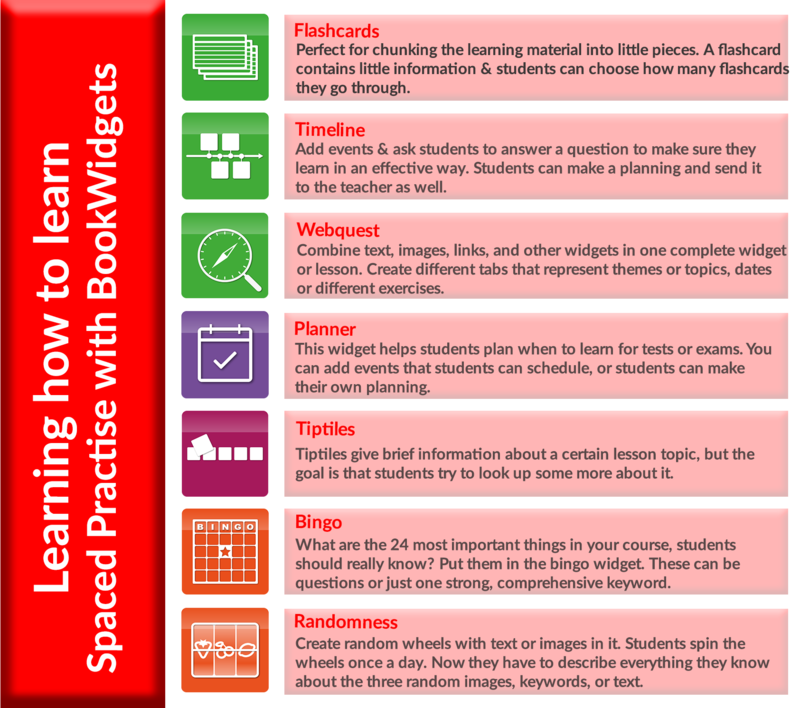 To let your students space their practice by creating a tiptile widget with 7 tiptiles about your lesson or course. Every day of the week, they have to take a look at one tiptile and learn about it. The tiptile already gives some information about a certain lesson topic, but the goal is that students try to look up some more about it. Find or create a compelling image about your lesson (portraits, processes, poem, buildings, areas, maps, …) and add a question (text) to the image. Students have to find an answer to the question. Find or create a compelling image about your lesson, and add an audio fragment. Ask students to find the link between the image and the audio file. 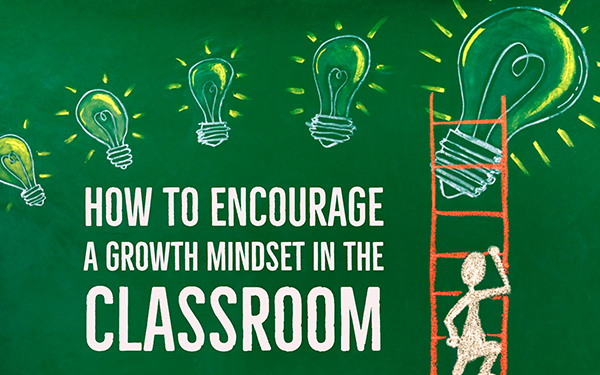 So, I hope you can use these ideas to teach your students how to learn effectively. After all, you hand them everything all that’s needed in these widgets. They’ll have to take the responsibility to spread their learning over different days, weeks and months.